When we were asked by Airbnb to speak about Strategic Risk Taking at their annual conference in November we wondered why they considered us the right fit for such a serious sounding topic. After all we’re just two "happy-go-lucky” Senior Nomads traveling the world. Oh…I suppose we did decide to retire early and reduce our income by about 90%. And we did sell our cars, our boat, and most of our stuff. And… just last year, we sold our house. We also left behind everything that was comfortable and safe, and said good-bye to family and friends. So maybe that does sound a little risky. We accepted the invitation and were happy to share examples of how we took a few chances, but really, we wanted to talk the rewards. Being together twenty-four hours a day definitely had both risk and rewards. Mostly rewards! Personal risks included the prospect of being together twenty-four hours a day. I don’t have to go too deep into why that was on the top of the list. Like so many couples we were both working full-time, active in the community, and spending time with friends and family we’d often see each other in the morning and then not again until dinnertime or later. Now - without any “easing into it” we would be seeing a lot of each other. And then there were those we wouldn’t be seeing for a long time - our many friends and family. We would give up time with grandchildren and celebrating special occasions while we were away on this grand adventure. There was also the risk of “Failure”. Could we pull this off? No one wants to embark on a grand journey and fail, but what if the whole hypothesis of “Living our daily lives in Airbnbs just as we would have at home in Seattle” didn’t work? And there was the stress that comes with travel - especially to foreign destinations. The time zones, the language barriers, the wear and tear of transportation schedules, security at airports and train stations, finding our next home and being able to connect our phones and computers in each new country. What if our our Airbnb didn't meet our expectations or someone won’t be there to meet us? Or what if we couldn’t find it - or we got the dates wrong, or…? All together it was enough to cause anyone to pause and think this was good idea! Could we travel full-time with all of our possessions in just 6 bags? We met people who did it with less - that's a goal for this next round! As for Financial risks - there were plenty. Mr. Campbell likes a good Excel spread sheet. Beyond being our Chief Travel Planner, he is also our “Numbers Guy.” He ran a lot of scenarios before we decided we could give this lifestyle a try. And no matter how he sliced it, even with getting our monthly expenses down to the barest minimum - we’d be working with a tight budget. We’d stop earning money (beyond his Social Security) and we’d start spending-down our retirement savings. How much would a prudent couple spend each month from their savings? And would that be enough to finance this venture while holding back some for when we stopped traveling and settled somewhere. Could we stay within our estimated budget? Would there be unknown and unexpected expenses that could bring the whole venture to a halt? What if we couldn’t actually find decent places to live within our budget? After some trial and error that first year, we realized we could probably manage - and we were having a great time, so we took a huge financial plunge two years into the journey. We sold our house…and we did it while we were on the road in Bucharest - a risk in itself. Now we would no longer have the one asset so many of us in America count on in retirement - our own home. What goes up, must come down! 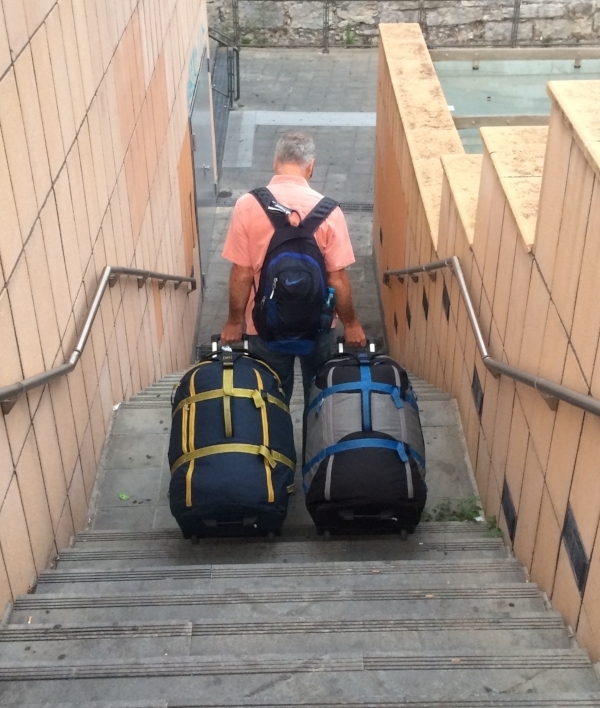 Everywhere we've been there have been stairs and cobbled streets - hard on us, but notour REI super-suitcases! That brings us to Physical risks. All things considered, Michael and I are very healthy. We’ve got the odd tweaks in our joints (Michael has had his right hip replaced twice!) and I am a cancer survivor, but all-in-all we left Seattle in good condition for our ages at that time, 58 and 68. But, would we have the stamina to traveling week after week, month after month? Over three years of travel we’ve put some miles behind us. We walk an average of 10,000 steps a day (about 4 miles) and it seems a lot of them involve stairs. What is it with Europe and stairs? And we haul our big bags up those stairs - and on and off trains, buses and the metro. Michael has developed what we call “Sherpa Shoulder” and I have fairly constant pain in my feet - but, hey, you can’t keep a good Nomad down. However we do worry about serious injury or illness so we try and be careful as we navigate, and we rest when we are tired - there are as many cafes as stairs! We also wonder if the international medical insurance policy we bought will work if we need it (thankfully, we haven’t had to find to find out) so we kept my personal health plan in the states along with Michael’s Medicare coverage. Of course hauling grand kids doesn't count! We have been fortunate to enjoy our French grandchildren often. 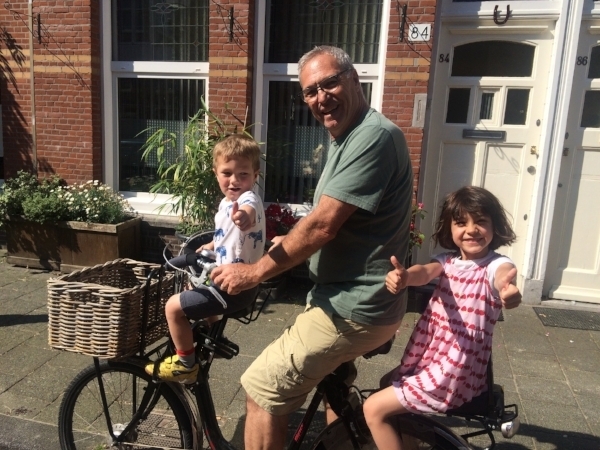 Here's grandpa with Marcel and Colette and (not shown) little Jacques. There are also risks to our sanity! Almost any travel can be exhausting physically, but the anxiety that comes with departures and landings, dealing with foreign languages (44 of them so far), customs, unusual food, shopping for said unusual food, and of course settling into each new home can make you a little…how about vexed? Yes. Vexed, as in frustrated, worried and anxious. Would we be safe? Could we thwart pick-pockets and avoid being taken advantage of? We’ve certainly found ourselves arriving at a few Airbnb front doors where the taxi driver wasn’t sure he should leave us. And then of course, we’ve made decisions to go places that could be considered unsafe including the Ukraine, Turkey, Israel and cities like Brussels and Paris. Not to mention Chernobyl the site of a massive nuclear disaster in 1986. 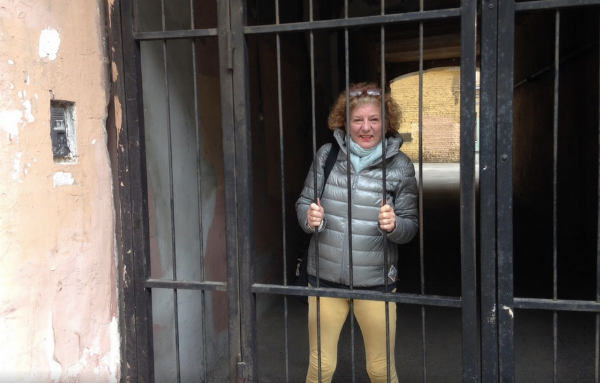 At the entrance to our Airbnb building in St. Petersburg - please let me out of here! We’ve just returned from another ten months on the road and soon we will be heading back out in February. So obviously the risks have been worth considering - and eventually taking. Giving our talk last month in Los Angeles gave us a chance to reflect on that. We saluted each other with some bubbly as we acknowledged our accomplishments and celebrated the many rewards this lifestyle has given us. The longer we traveled the more we felt our Senior Nomads life was normal! Personally we continue to be blessed with good health, safe travels, and a solid partnership. We discovered that we actually enjoy spending time together. A lot of time together - even in small spaces, like airplanes, trains, buses and tiny Parisian apartments. However, as Michael often points out - don’t try this unless you are traveling with your best friend. And that’s what we are. We’ve also been married for 38 years, but I’ve been saying lately we should call it 40 since we have accelerated our total time spent together as Senior Nomads. Part of why this works of course, is we are constantly planning ahead. So that means we are working together on several fronts that need collab-oration and cooperation. Whether plotting our course, researching our destination, choosing our next Airbnb, or haggling over the budget - we’ve got to do it together. And that also provides the satisfaction that a comes from learning new things - from travel apps to translations to figuring out how to take the local bus or even buy non-fat milk at the grocery store! The personal confidence we’ve gained allows us to move around in just about any new city, and we know we can choose the right place to stay (and then find it). We always try and make it fun. And when it’s not fun, we take a break and go out on our own for a while. Michael attends football matches whenever he can, and I love exploring markets and museums. Even though we’ve become very self-reliant, we are rewarded every time we approach a local for directions, help at the grocery store (I can’t tell you how many times we’ve stared glassy-eyed at mystery meat and dairy products) or just starting a conversation with a stranger waiting for the bus. The results are almost always lively and enlightening - and of course helpful. We’ve also made some great friends among our hosts. Seriously - we feel like we have family scattered in every country we visited. Some we’ve even gone back to visit - and someday, when we have a house we hope to invite them all to stay with us! We've made good friends all along the way. Here I am shopping in Cuba with our host Julia - her Airbnb in Havana is amazing! Financially, we knew there would be no return on this investment other than personal, and we understood that the savings “bathtub” would be draining one direction so we try and be aware of every drop we spend. We keep a daily journal where we record the day’s activities and our spending (including the receipts!) It was something I had to get used to, but like other things it has become routine and has its benefits. Our golden rule on spending is: “If you can’t eat it, drink it, attend it, read it, or get somewhere on it - you probably don’t need it.” That one has served us well. And for those who might think we are paid by Airbnb - that is not the case. In fact, after spending over 900 nights in Airbnb’s we are one of their best customers! However by purchasing our book, Your Keys, Our Home for 6,000+ attendees at their event in November, they have become a customer of ours. So now we have mutual admiration for each other, and we were able to add a little water to the bathtub. We’ve also been rewarded with clarity around just what we need in the way of “stuff”. Not much as it turns out. After we sold most everything we owned and put the rest in storage, we were left with what we thought we needed on the road And even that could be reduced. We do try and tell each other “My, you look nice today!” even though we are wearing the same clothes day after day. When we (me) do finally crack and need something new - it usually comes from a flea-market, and can easily be left behind as the seasons change. Physically the rewards have been mixed. We are certainly active, that’s for sure! And we are definitely in better shape and have lost weight due to walking and schlepping. And, because we cook most of our own meals we have a fairly healthy diet using ingredients from the local markets. Having said all that, we have declared Gelato a food group that can be eaten any time of day. But we do lift and carry to a fault. That is probably the biggest risk that hasn’t been rewarded. So far we haven’t been able to reduce what we feel we need to make this work. And that takes two 23kg suitcases and two heavy day packs. We’ll try one more time before we leave in February! Mentally this has been great for us! We are constantly using both sides of both of our brains - that’s four brains! We don’t need stimulating puzzles like Luminosity to keep us sharp - that’s for sure. We are travel planning, learning about our next destination, figuring out how to live locally, staying current with news around the world, writing, keeping up with family and friends and constantly trying to outscore each other in Scrabble, backgammon and cribbage. And we read, read, read. Speaking of books - having to write and publish our book in less than four months was a real brain burner! We have had so many wonderful experiences on this journey - however, this was not one of them. But who knows, we've only seen a fraction of the world and we are all set to head out again! I could write another thousand words just on the amazing number of people, places events that have made this Senior Nomad adventure one big grand prize! But, I will end it by saying this has become a lifestyle that we will continue until we aren’t learning every day, having fun, staying close to budget and still in love!